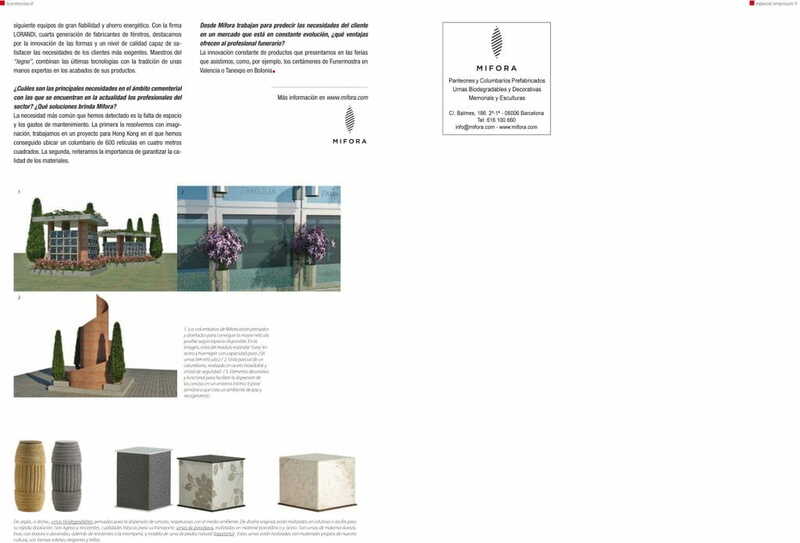 The product offer of Mifora includes from prefabricated mausoleums and columbariums to decorative and biodegradable urns as memorials and sculptures. A set of solutions for the funeral industry where the care for every detail is taken, providing their own identity to the concept, materials and shapes to make projects and products for the XXI century. 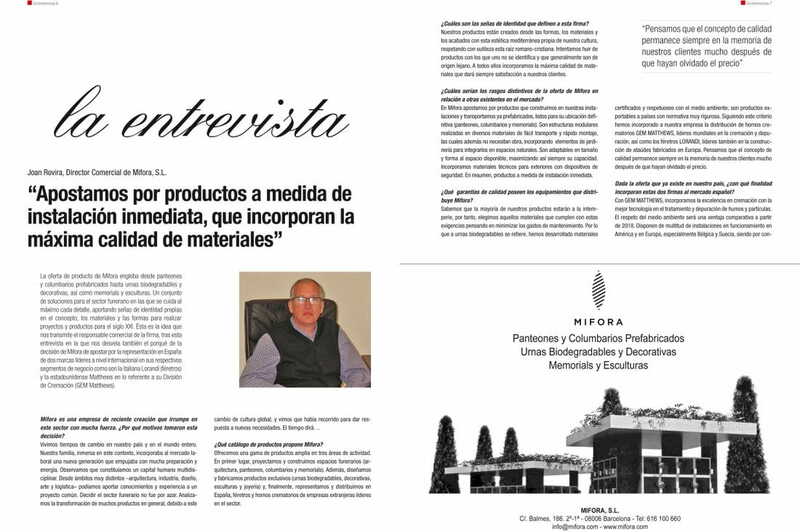 This is the idea that the Firm sales manager comunicates, after this interview where he also reveals us the decision of Mifora to bet for the representation in Spain of two leading international brands in their respective business segments such as Italian Lorandi (coffins) and U.S. Matthews concerning to their Cremation Division (GEM Matthews). Mifora is a recently set up company that breaks into this sector with a very great strength. What are the reasons that made you make the decision? We are living changing times in our country and in the whole world. Our family, immersed in this context was incorporating to the work market a new generation that was pushing with much knowledge and energy. We observed that we were constituting a multidisciplinary human capital. In very distinct fields- Architecture, industry, design, art and logistics. Deciding the funerary sector wasn’t randomly. We analysed the transformation of many products in general, due to this change of global culture, and we saw that all those changes had done the trip to give us answers to new needs. Time will tell. Which catalogue of products does Mifora propose? We offer a wide range of products in three activity areas. In first place we project and construct (Architecture, vaults, columbariums and memorials). Besides we also design and manufacture exclusive products ( biodegradable and decorative urns, sculptures and jewelry ) and finally we represent and distribute in Spain, coffins and crematoriums of foreign leader companies in tthe sector. What identity signs define this firm? Our products are created from the shapes , the materials and the finishes whit this mediterranean aesthetic typical of our culture, respecting with subtlety this roman-christian root. We try to avoid the products that we don’t feel idenfied with, and generally from a far origin. To all of them we incorporate the maximum materials qualtiy that will always satisfy our clients. What would the distinctive characteristics be in the offer of Mifora in relation to other already existing ones in the market? In Mifora we bet for products that we built in our establishments that we transport already prefabricated, ready for their final positioning ( vaults, columbariums and memorials). They are sectioned structures made in several materials, easy to transport and fast assembly, besides they don’t need construction job, incorporating gardening elements to integrate them to the natural spaces. They are adaptable in size and shape to the available space, maximizing always their capacity. We incorprate technical materials for the outsides with security mechanism. In summary, custom made products of immediate installation. What quality guarantees do the equipments that Mifora distributes possess? We know that the majority of our products will be on the outside, therefore, we choose those materials that fulfill these requirements thinking to minimise the maintenance expences. Concerning to biodegradable urns, we have developed certified and environmental respectful materials; they are products exportable to other countries with a very strict regulations. Following this criterion we have incorporated to our company the distribution of GEM MATTHEWS crematoriums, worldwide leaders in the cremation and purification, just like LORANDI coffins, leaders as well in the production of caskets made in Europe. We think that the quality concept always remains in our customer memory much after they have forgotten the price. Resulted from the already existing offer in our country. What’s the objective of incorporating these two firms to the spanish market? With GEM MATTHEWS, we incorporate the excellence in cremation with the best technology in the treatment and purification of fumes and particles. The respect to the environment will be a comparative advantage from 2018 on. They have multitude of installations already functioning in America and Europe, specially Belgium and Sweden being then high quality and energy saving equipments. With the firm LORANDI, fourth generation of coffin manufacturers we stand out for the innovation of the shapes and a quality level able to satisfy the most demanding clients. Masters in the “legno”,they combine the latest technologies with expert hands in their products finishes tradition. What are the main needs in the funeral field that this sector professionals find? What solutions does Mifora afford? The most common need that we have detected is the lack of space and the maintenance expenses. We solve the first one with imagination, we are working for a project in Hong Kong where we have got to place a 600 reticle columbarium in four squared metre. To solve the second one, we reiterate the importance to guarantee the quality in the materials. Mifora works to predict the needs of the client in a market in constant evolution. What ventages do you offer to the funeral professional? The constant innovation of products that we present in the exhibitions where we attend, as for example Funermostra (Valencia) o Tanexpo (Bologna) contests.